The Broadway Limited was a Pennsylvania Railroad passenger train operating between New York and Chicago from 1912 to 1995. The name “Broadway” was not a reference to the theatre district of New York, but to the railroad’s four-track right-of-way. Visually, it became a streamlined train on June 15, 1938 with cladding on the locomotives and redesigned passenger equipment. The designer of this look was Raymond Loewy, a French born, American industrial designer. He was also responsible for the design of stations, passenger car interiors and advertising. This train was in competition with the New York Central’s Twentieth Century Limited, which also provided New York to Chicago passenger service. It was one of nine express trains operated by the Pennsylvania Railroad and its name was changed in 1912 from the Pennsylvania Special. Its running time between these two cities was initially 20 hours, but that was gradually reduced to 16 and one half hours towards the end of its career. 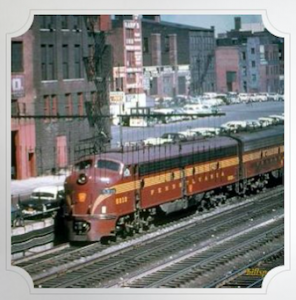 A re-design occurred in 1949, with the new train containing sleeping compartments, bedrooms, roomettes, drawing rooms, master rooms with radio and showers and dining cars and lounge car. It was a victim on the decline in passenger train use beginning in the 1950s and was merged with The General in 1967. When Amtrak assumed responsibility for passenger service, it eventually discontinued The Broadway Limited in 1995 in the face of financial losses.